In this fourth volume of Digger, covering chapters seven and eight of Ursula Vernon's webcomic, our wombat Heroine finds herself under the scrutiny of the universally feared matriarch of the Cerulean Hills hyena tribe, Boneclaw Mother. Should she survive, there is only the small matter of a ceremonial feast for the late hyena hunter Skull Ridges, which Digger unwittingly helped avenge — much to the consternation of all. (It's complicated...) A hyena long feast is no place for a vegetarian wanting to avoid offense and a one-way-trip to the dessert course. And there is still the matter of getting home without getting any deeper into the matter of nearly-dead Gods, insane acolytes, talking statues, or amoral shadow critters with a penchant for existential crises. When Surka (the ex-pirate captain shrew turned professional bridge troll) and Ed (the outcast hynena artist and master of the warrior-tea ceremony) are among the saner beings in your social circle, you KNOW things are just not turning out like you hoped. This collection also contains an excerpt from Hyena Hierarchies Today, courtesy of the collection of Librarian Vo, specifically dealing with the members of the Cerulean Hills Boneclaw tribe. 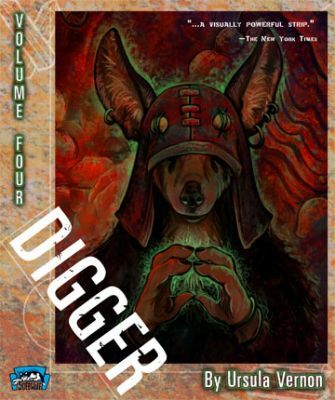 Winner of the Web Cartoonists' Choice Awards in the categories of Outstanding Black and White Art (2005, 2006) & Outstanding Anthropomorphic Comic (2006), as well as the Broken Frontier award for Best Webcomic Creator (2007), Digger has also attracted the attention of the wider comics industry — garnering Ursula Vernon a 2006 Will Eisner Comics Industry Awards nomination in the category of Talent Deserving of Wider Recognition.